Durham Tees Valley Airport is your link to North West Britain, making hiring a car, both self drive and chauffeur driven, an excellent choice of transport. With various hot spots worth a visit surrounding the airport, hiring a car is most certainly worthwhile. With 3 big brand car hire providers available at the airport, as well as Budget who compare a wide range of others, booking your hire car couldn’t be easier. You’ll find our car hire providers located in the arrivals hall, either as a Meet and Greet service, or a help desk, and they will then direct you to the car rental car park where your vehicle will be waiting for you. Booking your car hire online can be a great way of getting the best deals from the providers. To make your planning easier, why not use a comparison site to do the hard work for you? Car Hire Centre is a online comparison site comparing car hire at all of the top locations in the UK including car rental at Durham Tees Valley Airport. They can save you money and provide you with a quote in seconds. No need to fill in any personal details to get a quote either, and if you prefer, you can call them +44 (0)844 816 0099* if you want to speak to someone directly. Cover from Insurance4carhire can be hugely beneficial for flexible policies as well as a professional service. Book a policy today with the option for it to begin up to 364 days later. Click here to find out more. The airport is situated close to some of the most picturesque locations in the UK, including the North York Moors and Yorkshire Dales. These spectacular beauty spots are a short drive from the airport and make excellent holiday destinations. The Lake District is also close by and requires a scenic drive through the Yorkshire Dales to reach it. It should take you just over 2 hours to drive from Durham Tees Valley Airport and if you have hired a car, you can enjoy the journey and pack as much luggage as you like. Durham Tees Valley Airport is also close to Middlesbrough and the city of Newcastle, both of which have plenty of museums, shopping malls and sports stadiums to keep you occupied! When you collect your rental car, your provider will ask to see your driving license and usually a second form of identification such as your passport. A photocopy of any official identification will not be accepted, they will need to see the originals. Finally they will need you to produce a valid credit card. If the car is damaged during your rental the providers will charge this card for repairs. Therefore they take your card details as insurance in the event you have an accident. Once your provider has directed you to your vehicle, check the car thoroughly for damage. If you find any damage such as scratches, dents or scuffed alloys, ensure the provider is aware and that they document it on their damage report. Failure to do this may result in you paying for the damage at the end of your rental. When you get in the car, take a few minutes to familiarise yourself with the controls. Have a drive around the forecourt until you feel comfortable with driving the vehicle on the road. You can find out more about the definition of this charge and amount each provider charges their customers under “Additional charges” below. There are a whole range of different charges which may be added to your booking. Although some charges are mandatory, some charges are avoidable if you know a bit about them. Sometimes providers use sophisticated jargon and certain terms which can be confusing. You can define these terms and find out more about them by clicking here. The following charges are mandatory charges, but they can be reduced by taking certain steps or choosing your provider carefully. If your car is damaged during your rental you will be charged what the providers call a car hire excess charge to cover the repairs. This excess can cost anything up to £2,000. To avoid this charge you should buy car hire excess insurance. Insurance4CarHire offer some great rates for car hire excess and they will cover parts of the car providers will not in their own car hire excess insurance. For example, Insurance4carhire will cover the roof, tyres, undercarriage and windscreen of the vehicle. All of these parts are usually excluded from car hire provider’s car hire excess insurance policies. Car hire providers have to pay more to have a branch at an airport location, so this is why they charge you an additional airport surcharge fee. The amount of which depends on the provider. The only way you can avoid an airport surcharge fee is if you collect your car from the nearest local branch to the airport. This may involve getting a taxi to the branch or using public transport. Please remember that these prices are just a guide. Quite often car hire provider’s young driver’s surcharge varies depending on your rental vehicle, the country you’re hiring in and your actual age. If you want to learn more car hire tips and charges then visit the Car Hire Centre. There are 3 car hire providers at Durham Tees Valley and you can book a range of optional extras with each provider at different costs. Here you will find more information on each one, including what rental vehicle they offer their customer, plus products and services available at Durham Tees Valley Airport. Europcar offer their Durham Tees Valley customers the ability to book from their mobile, the option to book low emission vehicles, free delivery in the UK and a whole lot more. If you have an iPhone, download their app for free. Rental collections are available 18:01-07:59 Mon-Sun but will be subject to an additional charge. 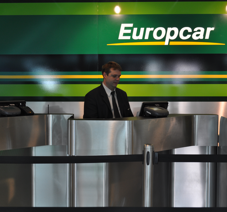 Europcar rental customers must be over the age of 22 to rent a car from Durham Tees airport. This charge applies to all drivers under the age of 25 and costs from £13 per day. Renters can book a Satellite navigation system from only £14 per day. Please request SatNavs when you make your booking to ensure availability. To add an additional driver you will be charged from £12 per day. Please note Europcar need at least 48 hours notice to fit Lynx hand controls to your rental vehicle. Starting your journey with Hertz provides a range of benefits. For example, you can earn Nectar points when you rent from Hertz. Phone: 08708 460010 or call 08433 093 075 for out of hours bookings. Please note – you will be met by a Hertz representative and taken to your hire vehicle at a servicing location, just outside of the airport. You must be over 23 to hire a basic vehicle from Hertz. Different vehicle groups have different minimum age requirements. A young driver’s surcharge of £15.75 per day will be applied to rentals where drivers are under the age of 25. Additional drivers: From £12 per day. Hertz offer a range of services for disabled drivers including Lynx hand controls. To find out more please call Hertz on +44 (0) 843 309 3075. 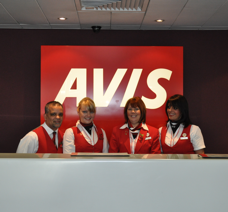 Book online or using your phone app for the best and most up to date Avis deals. Avis… We try harder. Avis only allow drivers over the age of 23 to hire a car with them. Drivers under the age of 25 will need to pay £11 per day as a young driver’s surcharge. Additional drivers can be added to your booking from as little as £11 per day. Satellite navigation systems are a great tool if you are unfamiliar with your rental destination. Avis offer GPS systems from only £11.99 per day. Disabled drivers can request Lynx hand controls by calling 0808 284 0014. Avis need 48 hours notice to fit any extra controls. 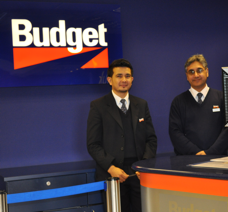 Book online with Budget to take advantage of their great deals both for professionals and holiday travellers. You must be at least at 23 years old to rent at this location. If you are aged between 23 and 25 years old you must pay a young driver surcharge of £32.50 per day. Additional drivers can be added for £11 per day. Any additional drivers must be present when you collect the car and meet Budget conditions of rental. See the Driver Licence / ID and Age Requirements sections in Budget website for full details.